One of Detroits true talents today, Amp Fiddler joins forces with Grammy Winner Louie Vega hitting you with some funk deep house on Vega Records. Amp Fiddler is the quintessential singer / musician who has played in the seminal band Parliament with George Clinton, and has had his own band for years now. Louie has always wanted to work with Amp since first meeting him at the Montreaux Jazz Festival when Amp and his band and Elements Of Life were on the same bill on the Worldwide stage. Finally coming together, Amp reaches out to Louie for a remix and the result is a beautiful soulful song written and produced by Amp Fiddler. 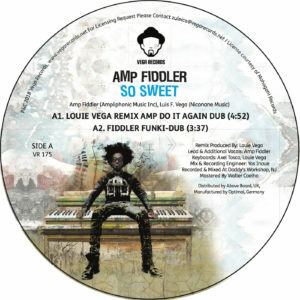 The remixes by Louie Vega combining deep house sounds with the funk synths played by Axel Tosca. There’s one version where Amp did more lead vocal overdubs and adlibs, as well a funktified synth solo version which gets immediate response when played. The four versions on 12” vinyl lend itself to different moods and are sure to bring you a dancefloor or house party on fire! Available at all vinyl stores, distributed by Above Board.